Don’t call it a comeback, Steve Rogers has been here for years. More than fifty years to be precise! 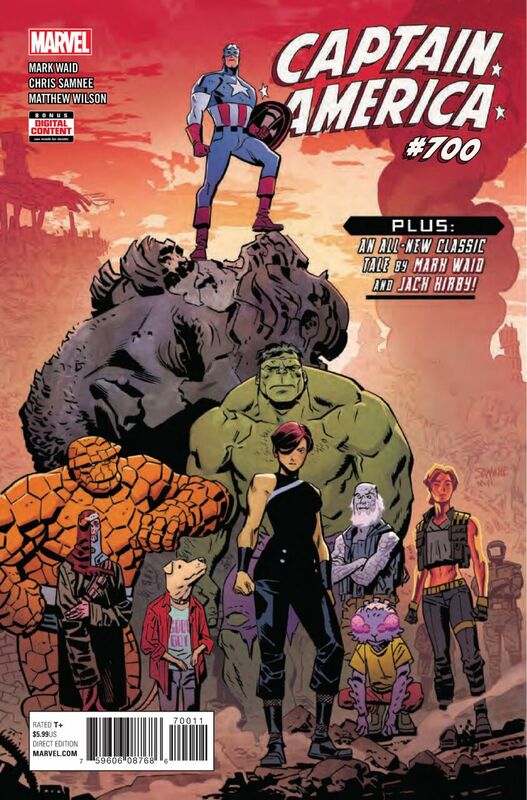 In a milestone event, Steve Rogers reaches his 700th issue. To celebrate, Cap has his best week in the Fantasy Comic League with an 18 point performance. He hits for the cycle in his solo book and earns his first “Hero of the Week” title. Falcon, Steve’s longtime ally, and fellow shield slinger is close behind in support of Steve. Sam Wilson spreads 16 points out over five books and finishes the week in a close second place. Similar to Falcon, Thor benefits from the three big events happening across the Marvel universe: Avengers: No Surrender, Doctor Strange: Damnation, and Venomized. In addition to a demonic possession in Damnation, Thor succumbs to the Poisons in Venomized. Her struggles earn her third place with 12 points. Spider-Man and Deadpool split fourth place with 10 points when the latest entry of their mutual book drops. Nadia Pym makes her official debut as a member of the revamped Champions teams and scores nine points, good enough for sixth place. Logan’s appearances continue to decline, but his eight points in his personal book put him in seventh place. Thanos, the Mad Titan, also has a big performance in his solo title. He fights an older version of himself and scorns Death, his longtime obsession, to score seven points and eighth place. Damnation and Venomized feature five of the six remaining heroes in the top rankings. Doctor Strange, Doctor Voodoo, Hawkeye and Venom all have a big role to play in the events, while Ms. Marvel leads a revamped team of Champions. They score six points to tie for ninth place. Blink, the sixth hero to score six points, has an even bigger part to play in the new Exiles series. The fan-favorite character begins a mission to recruit a collection of alternate universe heroes and save the multiverse. Valkyrie, one of the heroes expected to join her team, misses out on the beginning of the adventure so her Fantasy Comic League debut must wait till at least the next issue. The play of the week goes to Quicksilver. He makes the ultimate sacrifice in No Surrender to help release the numerous Avengers who had been frozen in place since the beginning of the event!